The Legend of Zelda is a microgame found in WarioWare: Touched! in the Retro Action stage. It is mostly based on the NES game of the same name, The Legend of Zelda, but also includes Zelda II: The Adventure of Link. The object is to tap all fairies onscreen to catch them and restore Link's health. 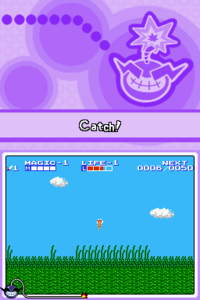 Level 1: The player must catch one fairy. This may occasionally be set in Zelda II instead of the first game. Level 2: The player must catch two moving fairies. Level 3: The player must catch two moving fairies from among a group of Like Likes. Upon success, a rock or bush slides away to reveal Link raising his newest treasure (a Nintendo DS) in triumph. For the alternate Level 1, a Zelda II Link runs past, and for Level 3, Link appears from the door at the top. This page was last edited on April 6, 2018, at 18:55.